This Week’s Look is taking a break this summer to focus on foster dog training and other off-internet activities, but we still couldn’t resist sharing what we found on eBay this week. 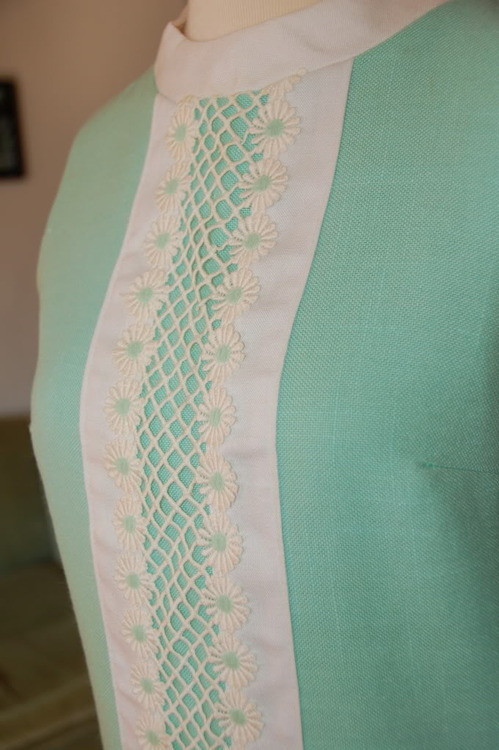 This 1960s shift dress is so mod and minty fresh with its prim, high collar and adorable daisy appliques, it’s perfect for the office and the weekend. Click on the images below to see the seller’s listing. Ahoy and other sailor clichés! 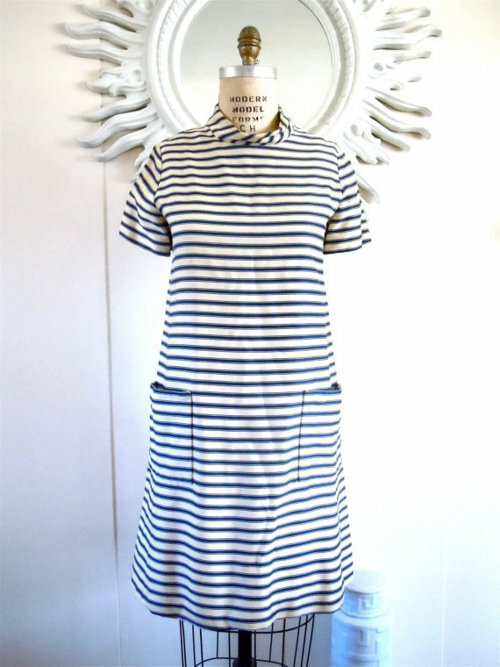 This week we have curated for you a collection of adorable, regatta-themed vintage dresses, all available right now from various sellers on etsy and eBay. Click on the images below to see the seller’s listing. Vintage 1970s velour-like maxi dress from PomPomClothing on etsy. $59. 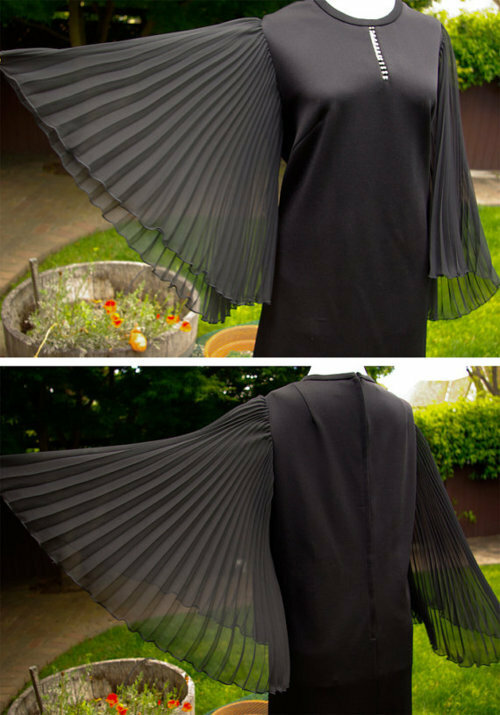 Check out the awesome back of the dress below. 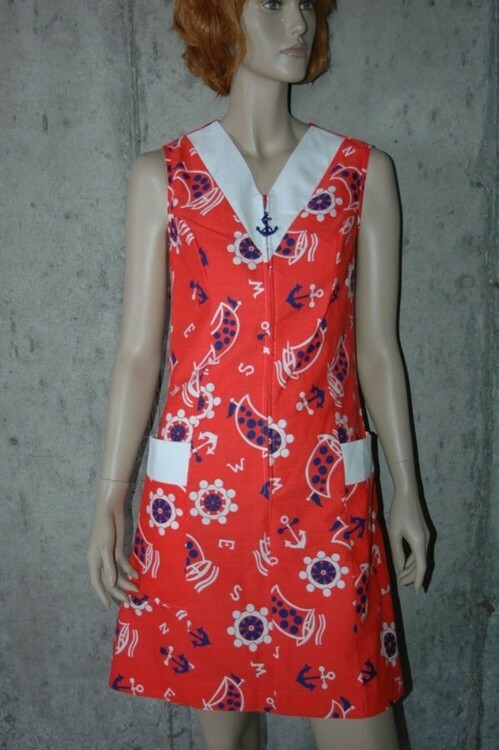 Vintage 1960s Ship and Shore shift dress from VacationVintage on etsy. $42. 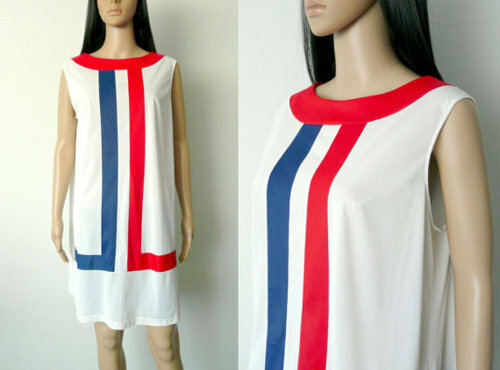 Vintage 1960s red, white, & blue sheer nylon dress from freebornstreet on etsy. $20. 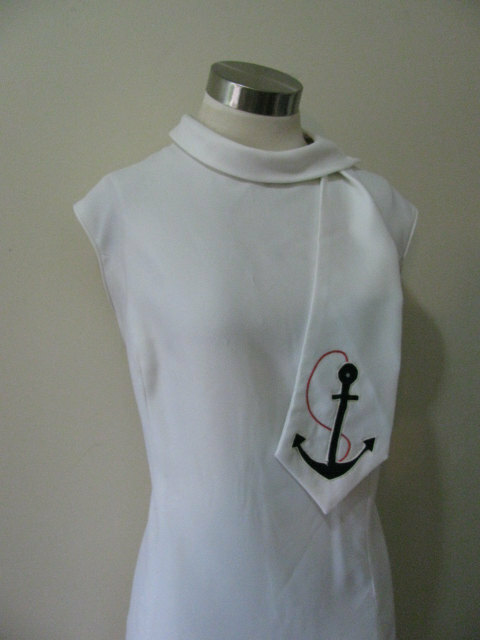 Vintage 1960s mini dress with sailor collar and matching belt from oldage on etsy. $57. 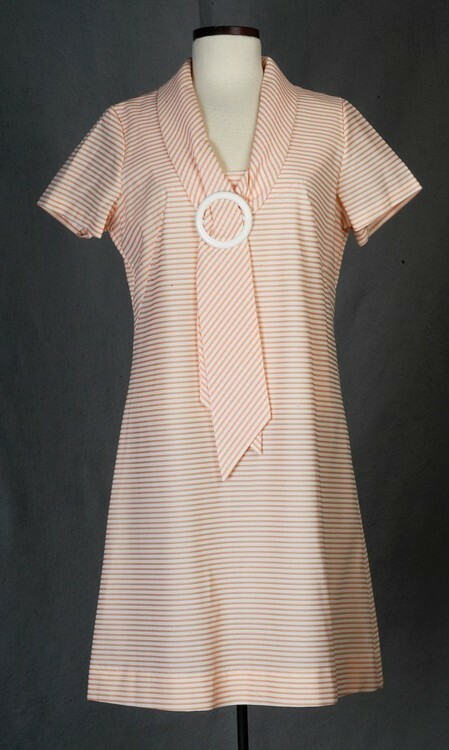 Vintage 1960s coral and white striped dress with adorable sailor ascot, size M-L. $30 on eBay. Vintage 1960s nautical jumper with dropped waist and anchor appliques from PomPomClothing on etsy. $69. 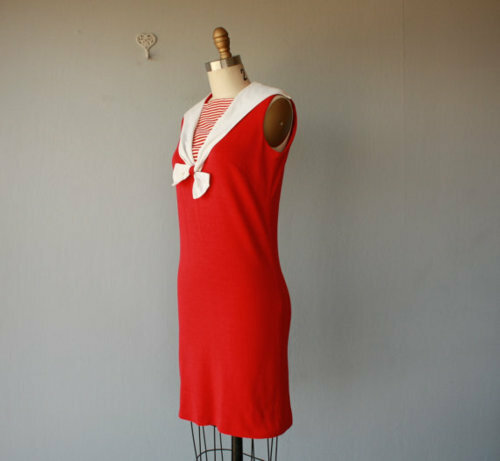 Vintage 1960s bright red dress with white linen sailor collar from CustardHeartVintage on etsy. $78. 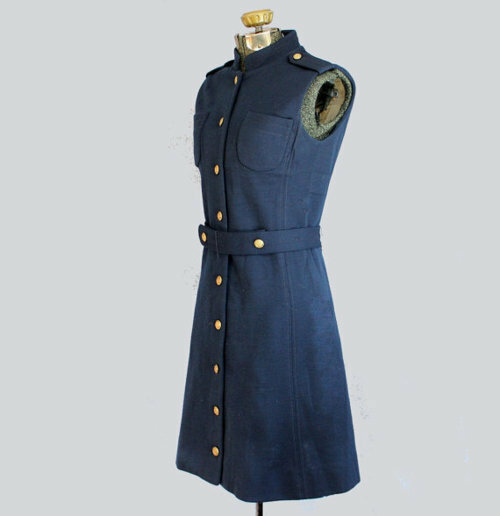 Vintage 1960s navy blue mod wool dress from LeMollusque on etsy. $57.80. 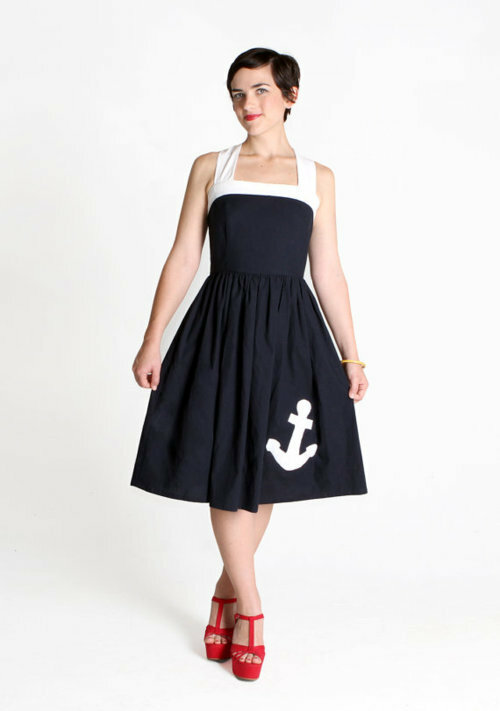 The custom “Anchors Away” dress, made in your size by QsDaydream on etsy. $125. Vintage 1960s striped textured dress with sailor ascot from sarabeat on etsy. $30. 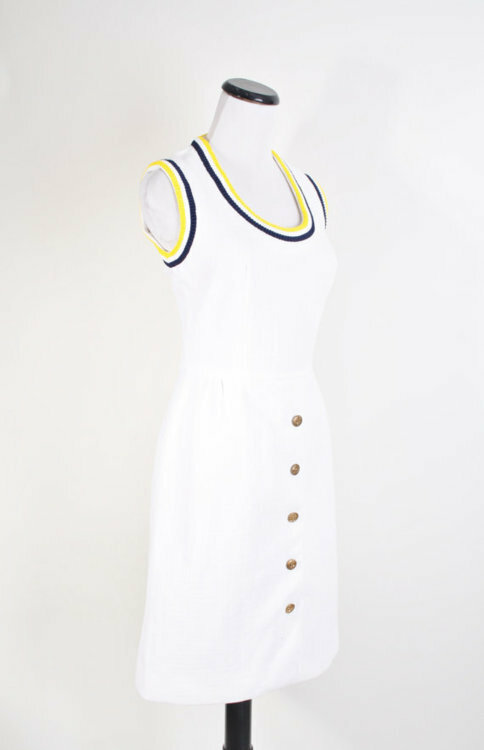 Vintage 1970s sporty poly knit nautical-themed dress from worldmarketproductio on etsy. $75. Vintage late 1960s Peck and Peck 5th Avenue striped dress from SararaVintage on etsy. $82. 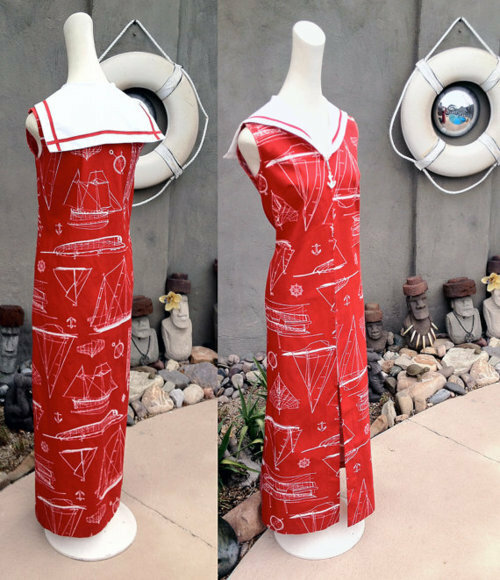 Vintage 1960s-70s sailing print maxi dress from elliemayhems on etsy. $69. 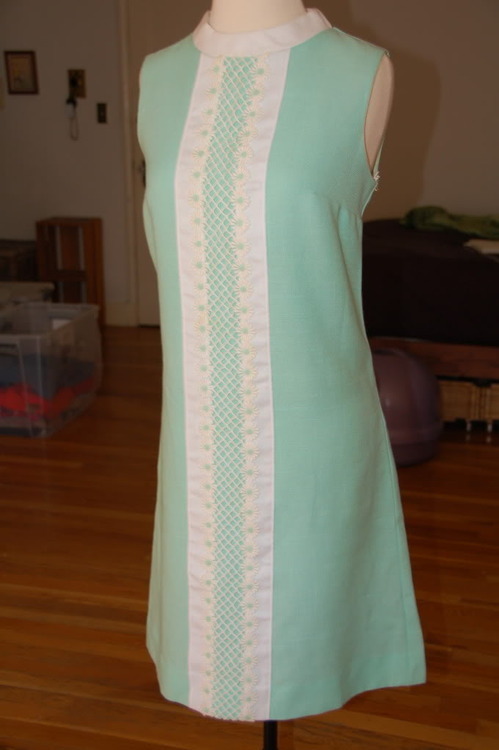 Vintage 1960s nautical-themed shift dress with high turned down collar from haywoodcreektures on etsy. $24.95. Vintage 1960s to 1970s nautical print picnic dress from figanddorothy on etsy. $44. 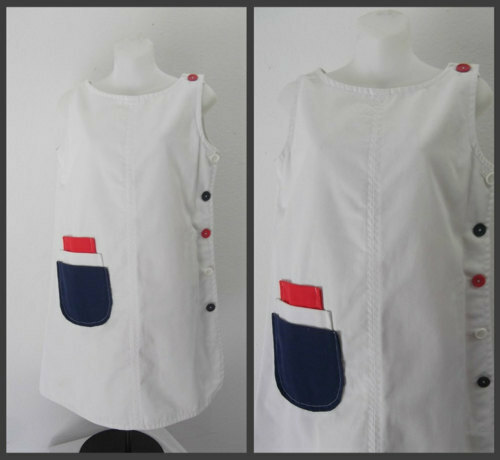 Vintage 1960s nautical-themed mini dress with stacked pockets from ResurrectingVintage on etsy. $35. 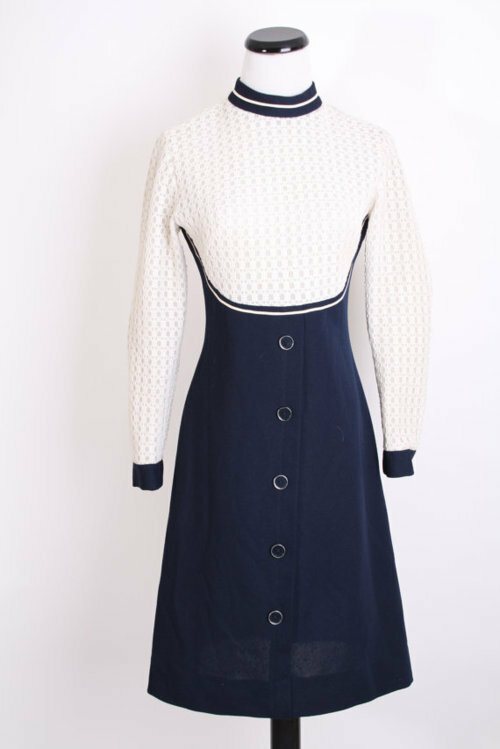 Vintage 1970s navy and white dress that does a lot to whittle the waist. Available from aiseirigh on etsy. $40. 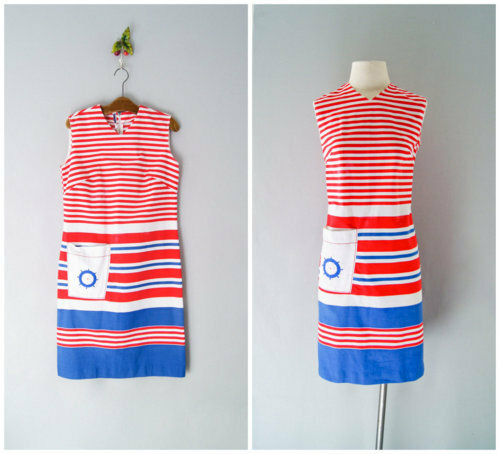 Vintage 1950s red, white, and blue striped dress from Hottmilk on etsy. $65. 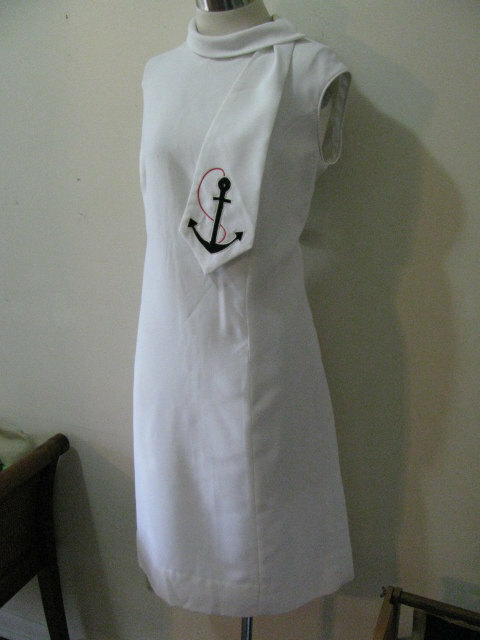 Vintage 1970s Missy House of Canada crisp white dress with anchor buttons from aiseirigh on etsy. $54. This week we are at full attention for this 1960s to 1970s green mini dress with fantastic buttons, deep patch pockets, and red trim. Sold by GoodTimeIsland on etsy for $55. Click on the images below to see the seller’s listing. At ease, soldier. 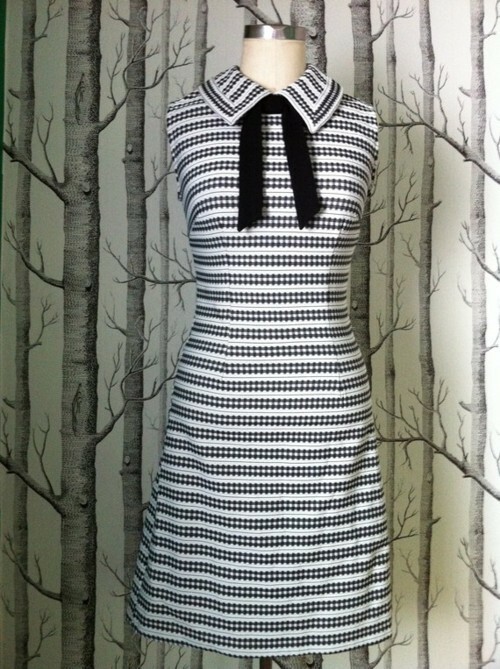 Earlier this week we curated a collection of vintage black dresses inspired by the season premiere of Mad Men. Unfortunately, we found so many fantastic pieces on eBay and etsy that we had to divide them into two features. Below you will find part deux of This Week’s Look, which features a number of vintage 1960s black mini (or mini-adjacent) dresses, all available on etsy or eBay today. Click on each image to see the individual listing. Vintage 1960s rhinestone trimmed cocktail dress from GabiLu91 on etsy. $235. Vintage 1960s “Leslie Pomer” label dress with accordion pleated angel sleeves and rhinestone trim from Jewels4pandas on etsy. 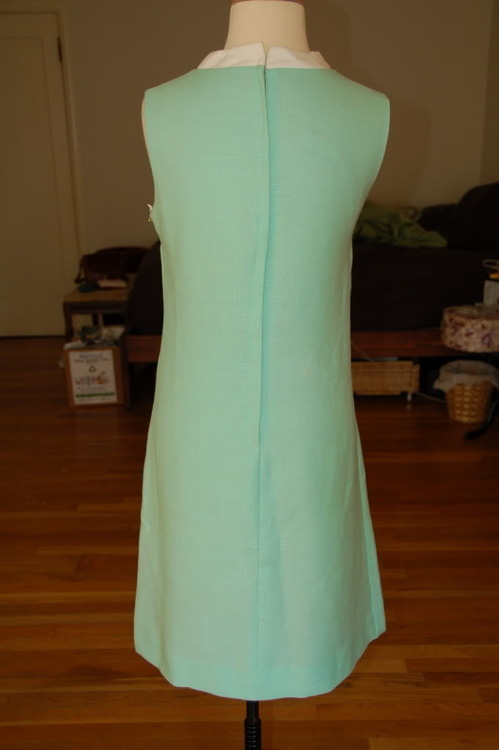 This is a maxi length dress that could easily be shortened to a mini. Vintage 1960s cocktail mini with sheer sleeves and rhinestone encrusted buttons on the cuffs. $38.95. Vintage 1960s mini dress with sheer pleated sleeves and rhinestone buttons on collar and cuffs from BombshellShocked on etsy. $63. 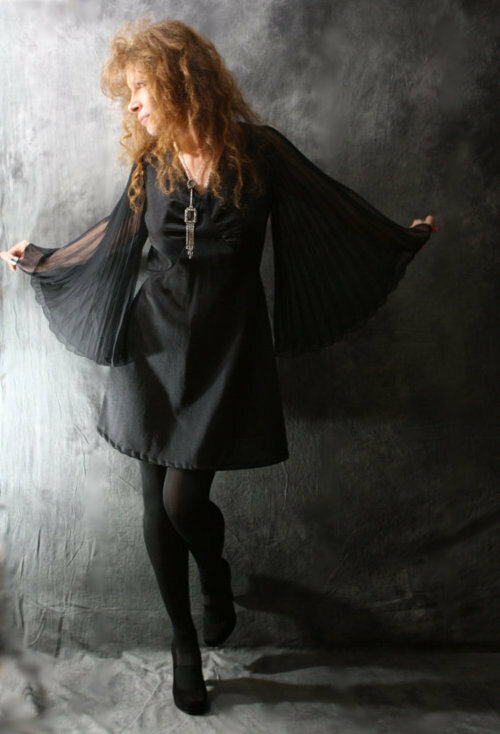 Vintage 1960s to 1970s mini dress with sheer pleated angel sleeves from MajikHorse on etsy. $70. Vintage 1960s mini dress with jeweled button cuffs from GravelGhostVintage on etsy. $50. Vintage 1960s to 1970s mini dress with jewel trimmed collar and cuffs. Current bid on eBay is $50. Vintage 1970s crocheted mini dress with scalloped edges. Current bid on eBay is $128.50. Vintage 1960s cocktail dress with sheer chiffon sleeves and perma ruffles. Current bid on eBay is $12.99. Vintage 1960s stunning cocktail dress trimmed with mink tails from carelessdarlin on etsy. Vintage 1960s mini with empire waist sheer angel sleeves from MsCharlie68 on etsy. $63.99. 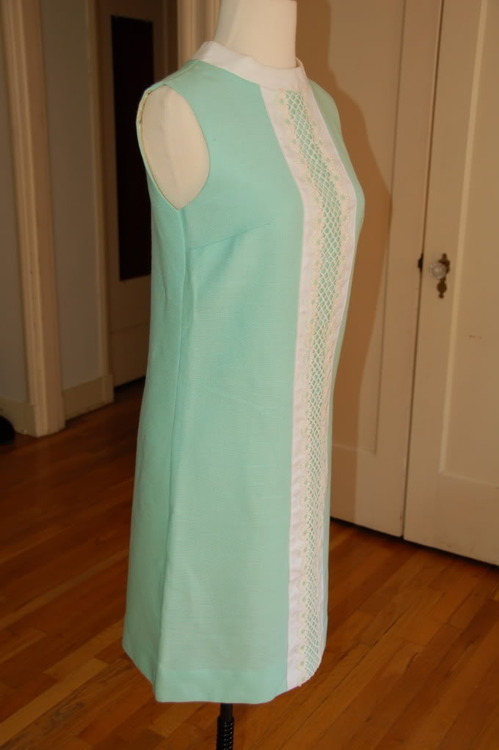 This week we found this perfect for summer, vintage 1960s mod/space age tent dress from hellhoundvintage on etsy. $100. Click on the image below to see the seller’s listing.